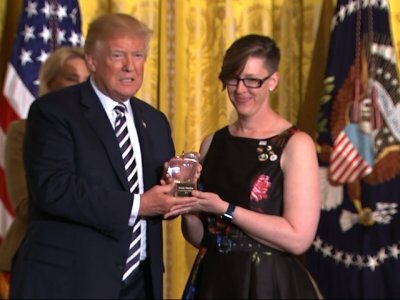 WASHINGTON (AP) — President Donald Trump presented the National Teacher of the Year award on Wednesday to a Washington state educator who gave him a stack of letters from some of the teenage refugees she teaches that talk about what coming to the U.S. has meant to them. Trump did not mention the types of students Mandy Manning teaches during a White House ceremony honoring her and other winners. Manning teaches English to new refugee and immigrant students from all over the world at the Newcomer Center at Joel E. Ferris High School in Spokane. The word “citizens” was written in all-caps in the president’s prepared remarks while the other words were lowercased. The remarks were projected on three teleprompters in the room for him to read. The Republican president has taken a hard-line approach to both legal and illegal immigration and for a period suspended the U.S. refugee program. During the campaign, Trump compared refugees fleeing war-torn Syria to a Trojan horse carrying would-be terrorists. He also proposed banning Muslims from entering the country. Manning told The Associated Press after the ceremony that she used a private moment with Trump to give him stacks of letters written by her students and members of the Spokane community. She said she told Trump she hoped he reads them, and she encouraged him to visit her school. Manning said the letters convey important messages about what coming to the U.S. meant to the immigrants and refugees. Every president since Harry Truman has honored its winners in a White House ceremony.